What time is it? What time does it have to be done by? What time are you supposed to be there? 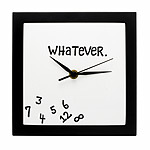 Sometimes, you just have to say “Whatever.” There’s no need to fall in lockstep with the regimens of the bustling bodies outside: With this “whatever” clock you can reject their meticulous punctualities and chronological obsessions, and just say that one word that can answer all their questions.